This delightful cottage has been fully modernised and equipped to high standards. It's special attraction is the rail side location and watching the steam locomotives pass slowly by is a real treat. The railway is a tourist attraction and trains only run during the day.Please note that trains do not run during some winter weeks. Footpaths and bridleways radiate out in all directions from the front door and open up to the whole of the North York Moors national park for the keen walker or cyclist. Places of interest such as Castle Howard, Whitby(we also have a cottage in Whitby E2561), Scarborough and York are a short drive away. The cottage has a well equipped kitchen, sitting/dining room, two bedrooms, bathroom and a garden with furniture and BBQ. It is cosy and warm with gas central heating and double glazing. The main bedroom has a superior king size bed and the twin room has two full size adult single beds. There is free WiFi access at the cottage and a TV digital recorder. I am a recently retired community pharmacist and my wife is a retired teacher.We love using the cottage ourselves when not occupied by guests and take a pride in presenting it to a high standard. As we live less than an hour away from the property we are able to clean and service it ourselves to ensure standards are maintained. My wife and I had spent several years trying to decide where to buy a holiday cottage. By good chance I happened to be trawling through the property websites and found a cottage just outside Pickering which had recently been refurbished. One quick look at it on a snowy day in the middle of winter and we were both smitten. The area is stunningly beautiful and when the sun shines we honestly can't think of anywhere better than the North Yorkshire Moors. The cottage is under a mile from Pickering and we always enjoy the walk through the woods or along the beck into town. Although we did not think we were railway fanatics when we bought the property we are still unable to avoid rushing to the window to watch the steam trains go by. Sir Nigel Gresley is our favourite. We have become a bit like the railway children as we can't help waving at the people on the train. Pickering is a really friendly little town where people seem to have the time to stand and chat. There's loads of good eating places in and around the town. We are still finding new pubs to try each time we go over to the cottage. We are keen walkers and mountain bikers and we have yet to exhaust all the possible routes from the cottage. What more can I say - we just love it! One bathroom with corner bath and shower over, wc and wash hand basin. Toilet rolls and hand wash are provided. Light and airy sitting room with dining area. Quality furniture and satellite 32" flat screen TV, DVD and digital recorder. Electric stove in traditional Victorian surround. Books, including novels and walking books, games and DVDs are provided. New fully fitted kitchen with electric oven and gas hob, fridge/freezer, washer/dryer, microwave, toaster, kettle etc. A coin operated payphone is located in the kitchen. 32" flat screen TV with digital recorder. Decked terrace area with seating. This sunny area is ideal for watching the passing trains. Notes on accommodation: The cottage and area is suitable for children but we do not provide a cot or high chair. Unfortunately we do not take dogs. We operate a strictly no smoking policy in the cottage. 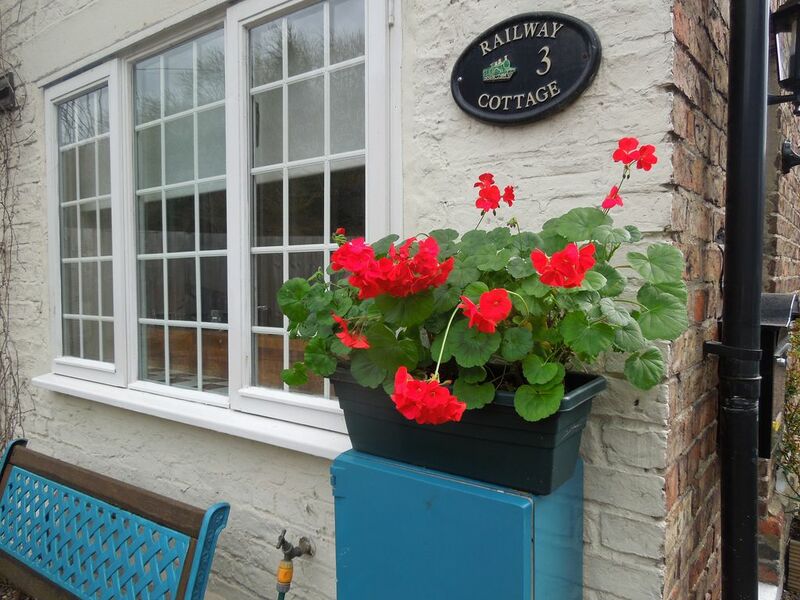 Outside: The rail side cottage garden is a special feature of this cottage. A small decked terrace at the rear of the house is the perfect place for viewing the steam trains. There is also a decked dining area with a table and four chairs and BBQ. There is parking for two cars. Cleaning / Towels / Linen / Maid service: Good quality bed linen, towels and tea towels are provided. The rental price includes gas and electricity. The cottage will have been fully cleaned before guests arrive and we would appreciate it left in a clean and tidy state at the end of the stay. Thanks for your review. We are glad you enjoyed your stay. Very good, everything we needed. This was our third visit to Railway Cottage and had a great time again, made better by there being a steam gala on and there were more trains up and down. Great place to base a Moors holiday ramble from, and then there are the trains! Great location, easy access to local amenities. The best bit is you get to see the heritage trains EVERY day!!! The North Yorkshire Moors are minutes away and there are loads of places to see and walks to do. We love it! Thank you for taking the time to write your review. We agree that the steam trains are very impressive. This very comfortable cottage suited our needs well. We did something different every day of our week's holiday and this location is a perfect base for exploring. We enjoyed dashing out to watch the steam trains go by from early in the morning to last thing at night... especially the beautiful Pullman carriages with lights softly glowing at almost midnight! We are glad you enjoyed watching the trains. Sounds like the Pullman you saw was running late or it may have been a one off special event as they are usually much earlier. Once again Railway Cottage delivered on everything. The owners take so much care to present this cottage at a very high standard with everything provided that you need to enjoy your stay. We particularly enjoyed the garden during our time here which is well cared for and gave us inspiration for our own garden at home. We spent many happy hours sitting out admiring the variety of plants. The passing trains on North York Moors Railway always got our attention and we always enjoyed waving to the passengers on board. The walk into Pickering and back was done daily and it has a variety of shops on offer with a Lidl and Coop for all your grocery needs. All in all this was the perfect holiday. Thank you for writing your review. I am so glad you enjoyed your holiday. Lovely cottage with all we needed. Fun location. The cottage was nicely and comfortably equipped with all we needed thank you. We had a relacing stay exploring North York Moors and loved watching the steam engines go by (especially our two boys). Good location to walk into Pickering to the station and town so nice to leave the car put every now and then. Thank you for the welcoming bubbly too. We are really glad that you enjoyed your stay and thank you for taking the time to write a review. The beautiful coastal villages of Robin Hood's Bay and Runswick Bay are within easy reach and well worth a visit, as are the seaside towns of Whitby and Scarborough. All are around 20 miles from the cottage. Whitby can also be visited by using the steam railway which offers special return tickets. Airports: Durham Tees Valley airport 52 miles. Leeds Bradford airport 62 miles. Rail: NYMR steam railway station less than 1 mile. Malton station 9 miles. York main line train station 20 miles. Pickering is less than a mile from the cottage and there are a number of different footpaths which lead to the town. Helmsley 15 miles. Scarborough 18 miles. York 20 miles. Castle Howard 10 miles. Pickering is a lovely old market town with a large number of pubs and restaurants. There is an impressive Norman castle, a fascinating museum of Yorkshire life, a trout farm where you can catch your own dinner and the station of the North Yorkshire Moors Railway from which you can board a train to take you on a memorable trip through the outstanding beauty of the North Yorkshire Moors all the way to Whitby. Newbridge Cycle Park which has been created in the woods near the cottage offers short though technical routes and Dalby Forest offers extensive routes for all levels of cyclists. Booking Notes: A booking deposit of 25% of the total holiday cost is required at the time of booking. The balance is due 8 weeks before the start of the holiday. The cancellation policy is as follows: Up to 8 weeks - full refund. 4-8 weeks - 50% refund. 2-4 weeks - 25% refund. Less than 2 weeks- no refund. Nb If the cottage can be re-let then full refunds may be given. Changeover Day: Changeover day is usually Saturday but it may be possible to be flexible. The cottage is available from 4pm on the day of arrival and should be vacated by 10am on the day of departure. Notes on prices: Prices are for the cottage per week and are quoted in UK Pounds. 3 night stays are available at 70% of the weekly rate. Please check with owner for nightly rate for 4,5 or 6 night bookings. 2 night weekend stays are available through the winter months at a price of £180 for 2 people and £200 for 3 or 4 people.